When hunger strikes at noon time, you want a satisfying international lunch promotion that offers a great deal. 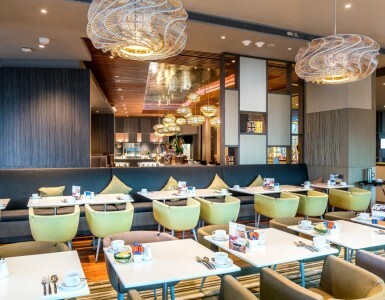 Your search ends at Novotel Bangkok Platinum Pratunam’s The SQUARE Restaurant and its 3 hour lunch buffet. Discover an extensive range of international dishes and desserts for under THB 1,000 per person! Take your taste-buds on a global journey this lunch time! Enter the SQUARE Restaurant’s warm and welcoming space before you see the elaborate buffet display. Be sure to try from each of the stations offering various cold appetizers and hot dishes. But where to start? Highlighted items are the home-made dim sum and roast duck, BBQ pork and crispy pork belly. Delight in authentic Thai dishes, spicy curries or fresh sushi for some Asian flavors. Or go European with freshly-baked bread and live pizza and pasta stations. But always keep room for dessert! Finish with seasonal fruits or our must-try blueberry cheesecake and bread & butter pudding. It’s a lunch buffet promotion for everyone to experience. Hungry shoppers looking to recharge or corporate guests with meetings at the hotel are well taken care of. 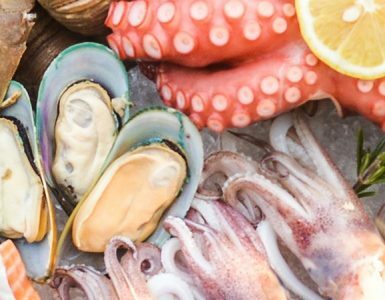 For seafood lovers, enjoy different kinds of seafood in our best brunch in Bangkok every Sunday! This wholesome meal is quite wallet-friendly to boot! At only THB 499++/person, enjoy more savings with our special discounts for Accor Plus cardholders up to 10% discount while dining! 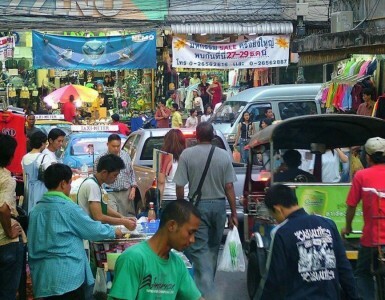 The Pratunam area is a bustling one, full of action and delicious food options wherever you go. But make no mistake; this is an international lunch promotion that won’t leave you hungry. The convenient city-center location makes it easy to reach via BTS Skytrain stations, public boats or private car. Try it every Monday to Saturday at The SQUARE Restaurant from 12:00 pm – 2:30 pm at Novotel Bangkok Platinum Pratunam.